Participants in A Walk For Water, both in New Jersey and Maryland, walked alongside Attaher Mohamed, a young Tuareg man who grew up in the area of Abalek in the Azawak. Attaher is here in the United States to continue his education. He found Amman Imman's website on the internet as he was searching for a way to help his people back home. This spring, Attaher traveled first to Maryland and then to New Jersey to help with A Walk For Water. Dressed in traditional Tuareg clothing of his homeland, he told the students what it was like for him as a child searching for water. We were all very moved by Attaher's story. He began his education as a child under very difficult circumstances and against all the odds he is now in the United States to obtain his college degree. 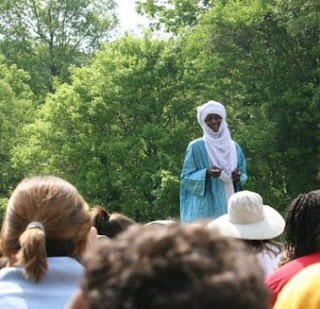 His goal is to to return to Niger and be a spokesperson for the people of the Azawak. Laurel Lundstrom, freelance journalist, editor and Amman Imman volunteer, recently interviewed Attaher. She wrote an article about him which appears in the July 29th edition of Pennsylvania's Patriot News. I encourage you to read Laurel's article which also highlights Amman Imman. Her writing captures the essence of Amman Imman while evoking the valor of a person from the poorest country in the world struggling to improve his own life for the greater purpose of helping his people. Attaher Mohamed sits in his barren living room in Lower Paxton Twp. -- a blanket imitating the furniture he has never owned -- worrying that his dream of coming to the United States will end. As he handles the metal jewelry that his father and uncle make in Niger to finance his studies at Harrisburg Area Community College, he wonders how many more necklaces he will need to sell to finance his stay. "I have problems. The number one problem is how to pay my tuition at the school," Mohamed said. "I owe the school $3,849. If I don't pay this amount before August, I will not register for the fall semester. My family is poor. They can't do [anything] for me." Although paying $3,300 in tuition and fees each semester and $600 in monthly rent might seem modest to many Americans who can apply for loans and scholarships, Mohamed is here on a student visa from the Azawak Valley of Niger, the most marginalized region in a country the United Nations Human Development Index ranks as the poorest in the world. If Mohamed cannot secure the money he needs, he might transfer to Guilford Technical Community College in Jamestown, N.C., where semester fees are only $2,000 and where he can live with his cousin. Otherwise, he might be forced to return to Niger. Without American sponsors, international students cannot secure loans, and without green cards, they don't have the option of working full time to earn money, according to the State Department. Most foreign students can only work on campus if they are not doing jobs American students would otherwise do and off campus if they face extreme financial hardship. Mohamed packs magazines for $10 an hour, 20 hours a week during the school year and about 30 hours a week during the summer. This is about the maximum amount of time the government permits him to work on an F-1 student visa. According to a report by the Institute of International Education, only 359 students from Niger were enrolled at colleges and universities in the United States last year. At the same time, U.S. institutions enrolled more than 76,000 students from India, almost 63,000 from China, and even 6,140 from Nigeria, which is one of only two African countries, alongside Kenya, to be ranked by the institute as a top 25 international student contributor to schools in the United States. Harrisburg Area Community College does a few things to ease the cultural transition of its 200 international students. "HACC has an international student coordinator to help them with orientation and advising throughout their academic career," said spokeswoman Tracy Mendoza. "Students are encouraged to join student organizations such as the International Awareness Club to share experiences, network and help other students who are also interested in different cultures." But financial and other constraints remain. Mohamed comes from a country where the United Nations Children's Fund estimates that only about 30 percent of young children go to school. He grew up in a region where so little humanitarian aid exists that education statistics remain a mystery. Most children preoccupy themselves with more dire tasks, such as fetching water for their families. "I thought I knew about water problems in Niger. I had no idea," said Ariane Kirtley, the founder and director of Amman Imman, the only project working in Mohamed's native Azawak community to bring water to the people living there. While there, she discovered "the worst suffering" she could possibly imagine. Many children living in the most remote areas of the Azawak must walk up to 35 miles just find water, she said. The majority of the 500,000 people living in the Azawak have no water for nine months out of the year because of a lengthening drought. During the three months they do have water, it is brackish, brown and thick with mud, dirtied by the people and animals bathing in the ponds. Kirtley said most people in the Azawak don't know what HIV/AIDS is, or even more basic things, such as the value of boiling their water before drinking it. The closest health center is a two-day trip by donkey. Half of children born there die before they turn 5; one-quarter die from dehydration, according to statistics gathered by Kirtley, who studied the region's public health data as a Fulbright scholar in 2005. But Mohamed, fortunate enough to live near Abalak, the Azawak's closest city, had a different life from his neighbors and even his four siblings, who never went to school. At age 6, he made obtaining an education his mission, begging his parents to let him go to a small government school in Abalak until they conceded. Although he had to walk 10 miles to school, the government provided him food and clothes, which enabled him to aim for more than just survival -- he could set his sights on an actual future. And with this future, he wants to give back to the Azawak. By doing an Internet search nearly two months ago, Mohamed found out about Amman Imman and quickly took an interest in the program's mission. He has participated in two Walks for Water, one in Maryland and one in New Jersey, where school children raised money and walked to raise awareness for the children in the Azawak. Mohamed speaks seven languages, four native to Niger, as well as French, English and some Arabic. He hopes to use his language skills to be an advocate for development and human rights. "I want to speak to people in Europe and the United States and tell them about the people of the Azawak," he said. "I want to maybe be a translator. Most people don't know about Niger or the Azawak; I am going to be someone speaking about help for them." Mohamed learned English at Issa Korombe, a high school in Niamey, Niger's capital. He had only traveled to the city twice before: once when his father went to sell the jewelry he makes and once while accompanying his mother to the hospital for treatment of hypertension, shortly after which she -- like so many others in her country -- died at 46. In Niamey, Mohamed met Hadiza Nana, his English teacher, who had attended college in Arizona. Nana convinced Mohamed that he should -- and could -- use his English skills and go to the United States. After being accepted to the University of North Carolina at Greensboro, Mohamed arrived in the States two years ago. With help from his uncle, who earned his living selling his jewelry in North Carolina at 40 times the profit he made in Niger, Mohamed lived with his first shower and flushable toilet. "I tell my family I can wash my clothes and take showers now, but they don't believe me," Mohamed said. He intended to live with his uncle, obtain his four-year degree, and perhaps return to the Azawak. However, financial constraints prevented him from continuing at the university, and family reasons have landed his uncle back in Abalak. Seeking an affordable education, Mohamed came to HACC a year ago. If all goes as planned, he will start his second year this fall, on a long trek toward earning a degree in international affairs. However, with his uncle home, feeding his eight children and making 40 percent less on his jewels, Mohamed worries. "It is very difficult for me because I don't have loans, financial aid or scholarships," Mohamed said. We celebrate and support Attaher in his aspirations to further his education and his dreams to help the people in the Azawak.